Ford’s new Fusion might do well to co-opt the old Miller Lite motto and tweak it a bit – Looks Great, Less Filling! That seems apt for Fusion’s hybrid model, which was my first full drive of the swoopy new Fusion with its fastback looks and Aston Martin-like grille. This is a looker to be sure. As one might expect with a hybrid gas/electric system under the hood, this runs quiet and delays your gas station visits a bit. 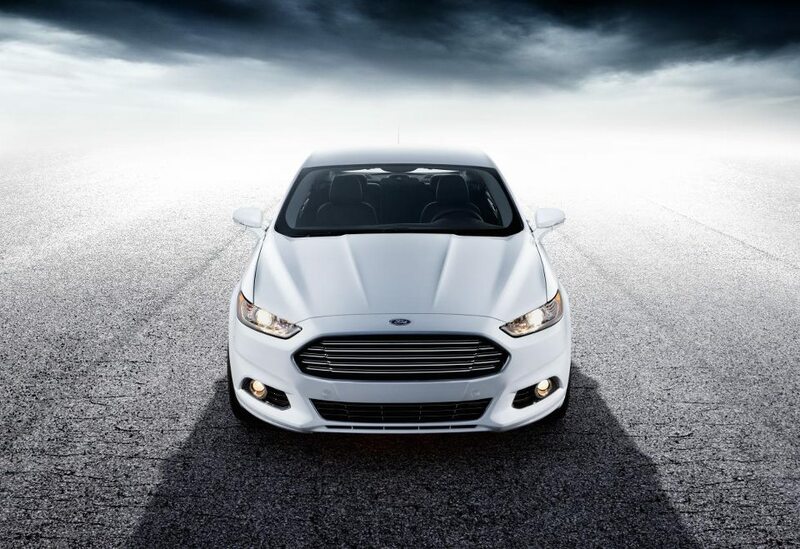 Fusion’s new system combines a highly fuel efficient. Atkinson-cycle 2.0-liter I4 with lithium ion battery powered electric motor and earns an EPA rating of 47 mpg city and highway. It’s rare that city and highway numbers are equal in a hybrid. Ford cuts the overall power from 191 horses in its former Fusion hybrid to 188 hp on this model, but also trims more than 100 lbs. from the car, 15 just from the gas motor. Yet while the car earns good EPA numbers, it has been criticized for not living up to those claims. My mileage fell short, but at 36.7 mpg in a week’s drive, it was still head and shoulders above other family sedans I’ve driven. Compare that to 27.4 mpg I got in a recent Honda Accord test, and 28.7 mpg in my recent Mazda6 test drive. If you accept that Fusion’s gas mileage is still radically improved, you’ll be happy with the rest of the car’s performance. I haven’t been in a gas-only powered Fusion yet, but this is one of the better driving family sedans I’ve been in of late. This is what my test car looked like in its Ice Storm paint job. Handling is fairly precise, not far off the Mazda6, what I consider the current benchmark for mid-size cars with a mainstream price tag. 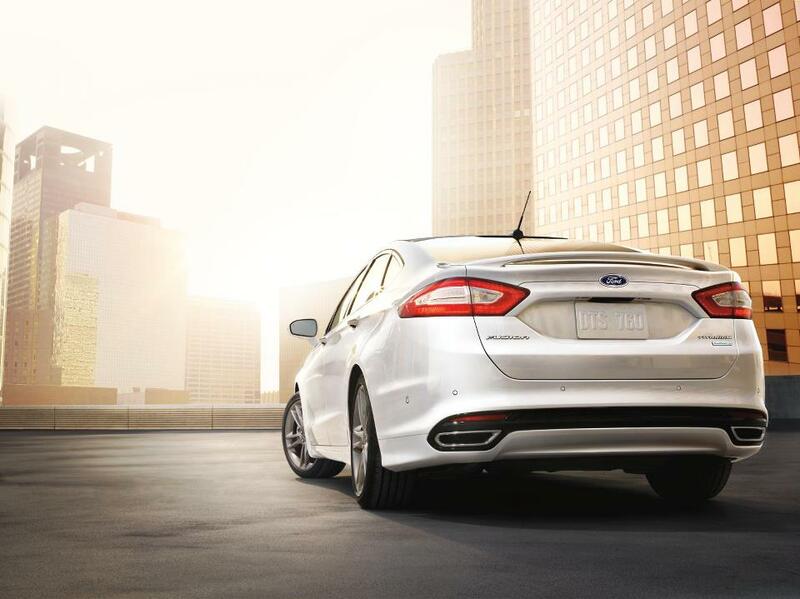 Fusion has a multi-link front and rear suspension and rack and pinion steering that combine to provide good road feel. The car steers quickly and is easy to guide through corners at a quick pace.Ride is absolutely excellent, something any family can appreciate. Bumpy pot-holed roads barely stir Fusion’s passengers. Yet the car does not feel overly cushioned.Acceleration is quiet, as the electric power starts you off from a stop, but when the gas engine kicks in its noise is well deadened. You feel it engage, but its growl is not as noticeable as in many hybrids; kudos to Ford for quieting the transition. Acceleration via the 2-speed ECVT automatic is smooth, but moderate. Entering a highway you can jam the accelerator to get up to highway cruising speeds, but you don’t get there as fast as with most gas-only sedans. Braking is fine from four-wheel discs with ABS and traction control. The front discs are ventilated too. Note that the brake pedal feels a bit soft though. Yet you must remember that you’ve got regenerative braking here that helps recharge the car’s batteries to power the electric motor. There’s even a readout on the left side of the dash telling you how efficiently you are recharging with your braking. I was in the 90-94% range most of the time. You are rewarded for long slow braking as you coast toward a stop. Inside, the Fusion is neat and tidy, the Ice Storm (silver-blue/green) colored test car going with a black cloth interior with black textured dash and matte silver dash, stack and door trim. The main gauges are easy to read and the center stack uses a touch-screen radio/navigation system ($795) along with touch-control climate adjustments below the screen. The touch-screen works fine, even when I was wearing gloves, and not all do. It includes radio, navigation, phone and climate. A real bonus here is that you can run the navigation system even when the radio is off. Ford beats General Motors on this one as most GM vehicles still require the radio to be on for you to see the navigation. However, the Fusion’s touch-control climate controls below the screen never worked until I took off my gloves. That seems inconvenient here in the upper Midwest where cold temps can keep us in gloves 5-6 months a year. There are, however, volume and tuning knobs, so that’s easy to work. Plus the manual tilt/telescope steering wheel has radio, cruise and other functions on the hub. Ford also includes its Synch system so you can call out your favorite tunes and link in your iPod. Yet the best feature inside the Fusion is its seating. First, you can fit up to five adults, but more importantly, everyone who rode in the Fusion praised its comfortable, extremely well formed and supportive front seats. The cushion level is comfortably soft and the seat shape is near perfect. One friend with a bad back wasn’t sure if he wanted to get out of the car he was so comfortable. Unlike the previous Fusion hybrid, the rear seats also will fold down to boost trunk space. And that’s good because the trunk is oddly shaped and just 12.0 cubic feet, while most cars in this class feature trunks of about 15 cubic feet. The problem is the hybrid system’s batteries intrude on the back side of the trunk, creating a shelf that prevents more than one large suitcase from being placed in the trunk. Several smaller ones will fit around the big bag, but on a trip I had to lower a portion of the rear seat to fit in a second large suitcase. The standard Fusion has a full-size trunk. The Fusion’s interior is attractive and easy to use, plus the seats are stellar. The test car’s were an attractive cloth. On the tech side, the test car also added adaptive cruise control for $995 and a reverse sensing system for $295, but no backup camera. I also appreciate Ford’s fueling system that does not include a filler cap anymore. Just pop open the filler door and fill up the tank. This is a bonus in lousy weather as you spend less time futzing with a filler cap. 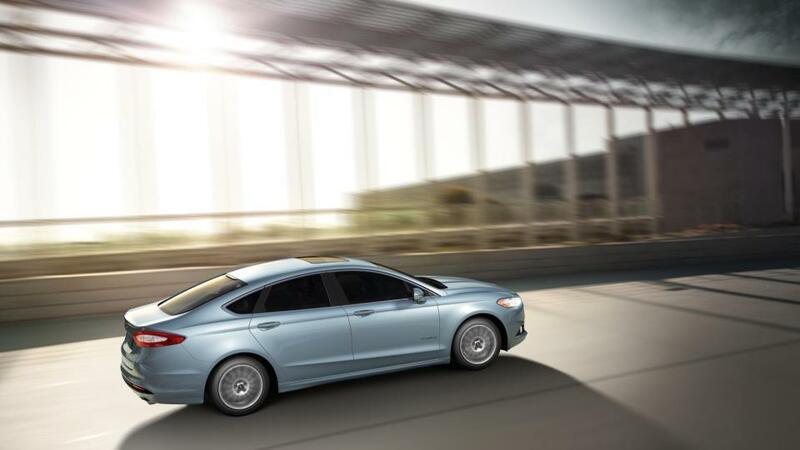 Pricing also is in the Fusion hybrid’s favor, considering it’s a fully functional family sedan with room for up to five adults. The hybrid starts at $27,200, with a $795 delivery fee. With options this one hit $30,975. If you prefer the base S model with a 156-horse gas-powered I4, the starting price is $21,900 and the car is rated 22 mpg city and 34 highway. Another option is the SE model with a 175-horse I4. It starts at $23,830. A horsier Titanium front-drive model with a 2.0-liter Ecoboost I4 gets 231 horses and is rated at 22 mpg city and 31 mpg highway. There’s even a plug-in hybrid Fusion, the Energi model, which starts at $38,700 and carries a 21 mile electric charge to boost fuel economy. So many choices, so little cash? That’s many folks’ dilemma when it comes to buying a car. But the Fusion is an economical family car in several modes, and even in hybrid trim it’s well priced. Fusion also is a delight to drive and ride in, and the seats make any trip a short one. Hits: Good gas mileage, quiet drive and interior with super well-formed and cushioned seats. Nice handling and ride with interior room for up to five adults. Touch-screen works fine, plus navigation runs even if radio is off. This car is a looker! Misses: Odd trunk shape of limited use for big luggage, moderate acceleration, climate control touch surface doesn’t work if you are wearing gloves.